Kim Deal is in an exciting place right now. Playing shows with The Breeders at LA’s Hollywood Bowl with Neutral Milk Hotel and Daniel Johnston, writing new music with The Breeders Last Splash line up, she’s keeping herself more than busy while somehow finding the time to continue on with songs nine and ten of her long running solo series. Deal has constantly delivered many pleasing tunes with the series: “Are You Mine” was a beautiful and thoughtful ode to Kim and Kelley’s Alzheimer’s-stricken mother, there was the lax instrumental awe of “I Wish I Was,” the tribal antics of “The Root” accompanied by the to-and-throw sway of “Range On Castle.” There have been some rockers too, including the indie stomper “Hot Shot,” as well as the rocking, instrumental “Dirty Hessians.” There are even more to talk about but it would keep me going on and on all day. Kim has kept us waiting a bit for this one but the patience has paid off. 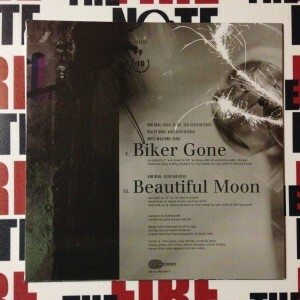 Song nine, the Steve Albini produced “Biker Gone” and song ten, “Beautiful Moon” are definitely worth the wait. “Biker Gone” comes paired with a music video directed by Lance Bangs (Nirvana, Sonic Youth, Arcade Fire) which sets the scene for the indie-dirge by having the players–Kim Deal, Kelley Deal, and Britt Walford (Slint and Breeders POD fame, first ever music video as well)–make up the staff at a funeral home during a biker’s wake. To quote a friend, “Biker Gone” gets the “best use of metal name tag in a rock video” award as well as being one of the strongest tunes in the solo series. The b-side “Beautiful Moon” takes us back to the calmer tones of the solo series. Kim uses a tempo that could come from Breeders cover/Ed’s Redeeming Qualities original “Drivin‘ On 9.” With what feels like and invitation to sit around the fire with Kim and her 6 string, she sings “If I walk quiet/I hear the birds pretty tune/high in the hills/me and this beautiful moon.” Another great lullaby to add to her growing collection. As it is with every Kim Deal solo series release, you can pick it up in one of two ways: there is the limited, 1000 pressed, white label 7” which currently is still available. 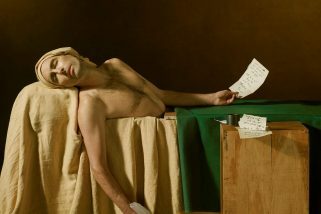 Alternatively, there’s the official art sleeve release. Deal can keep this up indefinitely as far as I’m concerned. While it’s not a full “solo album,” it keeps Deal from confining or trapping herself. She can try many things without worrying about convolution or consistency. It also makes it easy to get excited about what comes next. Maybe “Early Girl?” there is only one way to find out. WANT TO WIN THIS SIGNED COPY OF BIKER GONE?! 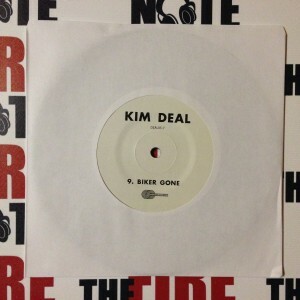 Just email your address to info@thefirenote.com with the subject KIM DEAL ROCKS. We will randomly draw a winner in two weeks. Good Luck! 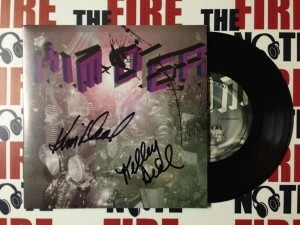 We also wanted to say a big thank you to Kim, Kelley and Kyle for the signed record. It has helped The Fire Note celebrate its 2 year birthday in style! my friends 12 year old son has become a big fan. This one is for Spencer!